In my journey to becoming one of the best female figure athletes in the world, I knew I needed guidance. With so many personal trainers out there, I wanted someone that knew how to train a champion. Not just train someone to lose weight or change their shape a little. I am a very self motivated person, so I did not look for the person to offer the encouragement or the nudge to get to the gym, (although I know Mark would do that if that is what I needed). I have been training with Mark since 2007 and have not only trained for improvements with each competition, I have challenged myself with achieving more titles each time. These include two consecutive Ms Olympia’s, three consecutive Ms Australia titles as well as two All Female Classic titles. Marks expert guidance gave me clarity in my training program and showed me the most effective supplements and nutrition for my goals. He pushed me beyond my limits to achieve my goals and never once did I question him. I had total confidence in his ability to train me. Each competition we set the bar higher and higher. When faced with the task to come in harder with much leaner legs for the second Ms Olympia title I was very hesitant to remove the cardio as Mark had wanted. There was no logic that I could apply from my experience that would give me the confidence with this plan. But with the sheer confidence I had in Mark’s knowledge, I trusted the result would come. In previous comp prep, I was used to doing 45 min cardio at 5 am (before the kids would wake) and then a gruelling 2-hour weight session at 9, immediately followed by the second cardio session of 30-45 minutes. The third cardio session would be somewhere in between doing the home reading with the kids after school and cooking the dinner. And all this was done at least 12-16 weeks out from a comp. Needless to say this comp prep did not have all that cardio included. Sure I trained incredibly hard in the gym and in the kitchen, and I literally swapped the cardio with more sleep and happier moments with my children. I also felt much more calm and balanced and surprisingly still maintained a higher level of carbs up until the competition than I had in previous times. 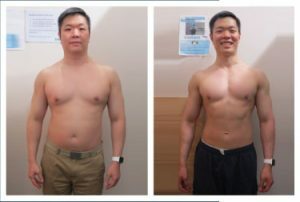 Having the weekly measurements, I was able to see the incremental changes in my body and that the program was working; seeing these changes, I became more confident in Mark’s plan as I am very results focused. If I were only to judge by the scales, then I would have ditched the program as there was not a whole lot of change in the body weight. Gratefully my body-fat was dropping, lean mass remained the same through the whole process and the targeted sites of my legs were also significantly dropping. I was very happy. Now we have my prep down to a fine art and science! Now that Mark has a process to eliminate the excess cardio and only use cardio as a final prep, WHY would you do it any other way?